A vision Hans Schneider once had for his backyard two decades ago is finally coming to fruition in Keizer Rapids Park. “I wanted to put in a sand volleyball court for our daughters, but my wife said, ‘No,” Schneider said. Fortunately, when Hans saw an opportunity to install new courts at Keizer Rapids Park in 2015, Vicki, his wife, put her full support behind it. The new courts gave birth to a sand volleyball youth club – offered at a fraction of the cost of comparable programs – and revealed additional needs. “We needed a place for the kids to cool down or get out of the rain,” Hans said. Earlier this year, he approached the Keizer Parks and Recreation Board with a proposal to invest in a covered shelter. He got approval and an $8,300 matching grant for the project. He hoped to have it installed over the summer but hiccups in ordering and delivery kept delaying the effort. “At one point, it was going to be delivered during the Eclipse Festival and that didn’t work so it got delayed another month,” Hans said. Once the shelter was on-site, Schneider and his accomplices in the project, which included park neighbor Jerry Nuttbrock, discovered that putting the thing together was going to take more than they knew how to do. “It’s not exactly an erector set,” Hans said. The new shelter had to be set on concrete footings before laying another concrete pad that serves as the shelter’s permanent surface. With the help of a local contractor, the shelter was put up in about two days. Schneider and Nuttbrock, along with some additional help, were laying the permanent surface this week. While the new shelter will more than serve the needs of the courts and club, Schneider said he wanted it to be something more than that as well. “I wanted a place where the families could come and have a picnic or a party,” he said. 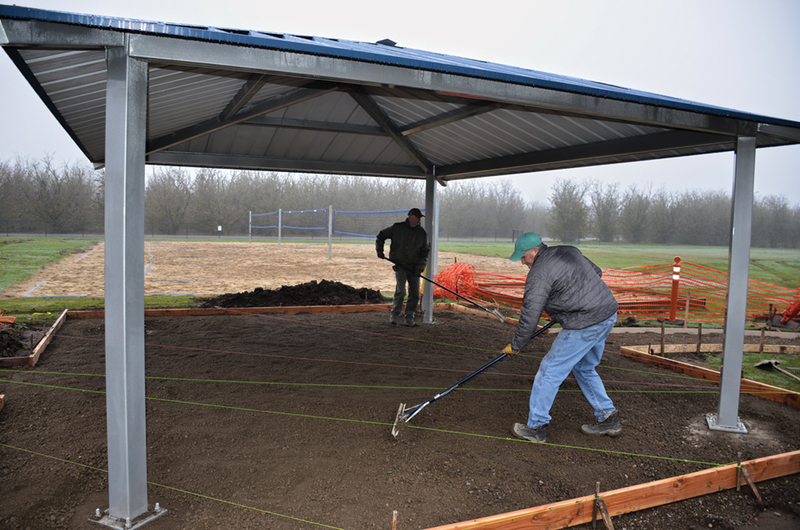 The result is the first covered area in all of Keizer Rapids Park. When all is said and done, the Schneiders will have invested well north of $10,000 in the shelter alone. “Vicki and I saw our parents giving back quite a bit and we are fortunate to be in a position where we can give back in the community and at St. Edward Church. Vicki also does a lot of volunteering with cancer patients and also for Marion-Polk Food Share. This has been a goal of mine and she, fortunately, has supported me,” Hans said. Those interested in the Keizer Rapids Sand Shark volleyball program can find out more about upcoming events on the group’s Facebook page.